Please allow me to introduce my new aquarium, furnished with the Koshiki sand that I brought in at such bodily peril, and several of its 15 or so kinds of inhabitants. This is the freshly set up tank as of late July this year. I bought all kinds of plants and threw them together more or less haphazardly. The powerful light and the different fertilizer schemes I was experimenting with contributed to a hideous algae breakout not long after this picture was taken. With various forms of chemical, physical, and biological warfare, the algae problems were finally brought under control two or three months later. Some of the biological warriors, the so-called algae control crew, will be introduced shortly. More or less he same area of the tank, as of December 22nd. 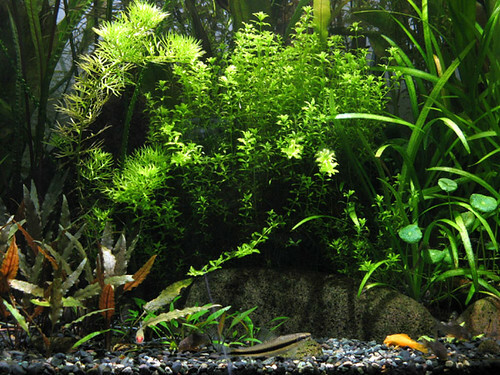 Plants require frequent trimming, and algae is under nearly total control. The algae-control crew now need regular supplements of parboiled spinach, and the tank is fairly pleasant and interesting to look at. Here, various fish vie for fragments of food tablets scattered over the substrate. 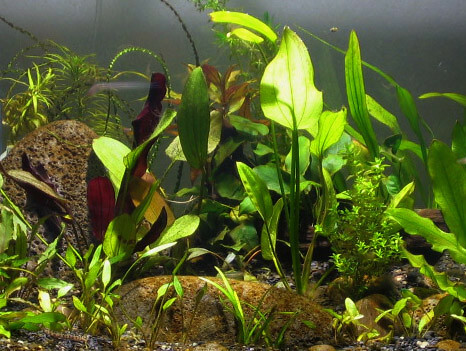 I've nearly finished learning about establishing and balancing plant growth; next will come the even more difficult task of achieving that delicate balance of gardening skill and artistic arangement that makes the successful planted aquarium so irresistible to look at. 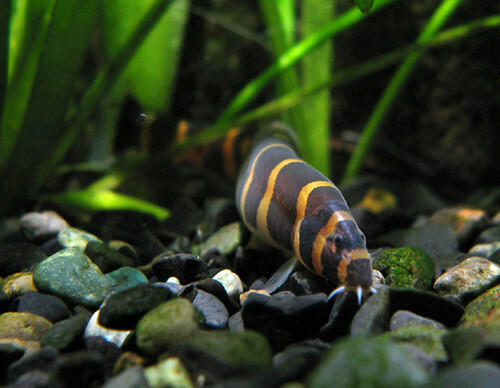 A fish that definitely enjoys the Koshiki sand is the Kuhli Loach (Pangio kuhlii). These small, eel-like fish used to be one of my favorites in my fish-keeping days of old, having adapted especially well to my estwhile small tank. During the day, they would be nowhere to be seen, but at night, their crazy wigglings seen from my bed in the half-darkness of my room would lull me to sleep. In my current tank, they are active day and night, and very opportunistic when it comes to foraging for food. For a long snaky fish, this critter is actually getting pretty fat. The shrimp Caridina japonica is one of the most interesting inhabitants of the tank. There are about 23 of these, constantly crawling and swimming about (especially at night). 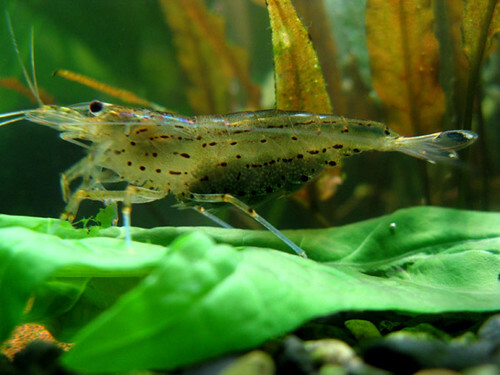 I originally bought a batch at the store, after reading about their near-miraculous algae-eating performance on the Net, mostly from reports by American aquarists: this native shrimp is indeed in high demand around the world. Subsequently, during a trip to a nearby mountain stream, I discovered it teeming with the same little creatures. I was delighted, and caught around a dozen more, introducing them to the tank. Since then, the larger females like this one (seen here feeding on parboiled spinach) can be seen carrying batches of eggs. The shrimp has a fascinating life cycle: afer a rather long incubation period during which the eggs remain attached to the mother shimp and are frequently fanned by her pleopods (stomach-legs), the tiny mosquito-larva-like young emerge and are subsequently washed into the sea by the stream where they were born. Spending a few weeks in salt water feeding on plankton, they finally metamorphose into tiny shrimp which, finding a river mouth, migrate up as far as its highest reaches. They even crawl out of the water and over the rocks in places where there are waterfalls or other obstacles. This reproductive cycle as well as other facts about the shrimp are, from what I gather reading the Net, generally misunderstood by today’s aquarists. For one thing, they are misled by the common Japanese name of the species, which is the Yamato Swamp Shrimp. But it lives in clear mountain streams, not swamps! Anyway, it can be bred in captivity by changing the salt content of the water appropriately, something that I will attempt to do soon (in another tank of course), to set the record strait and also because I am simply fascinated. 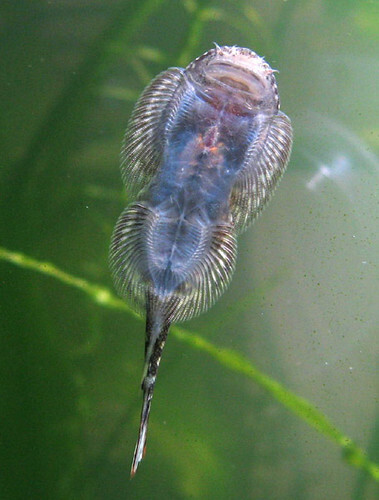 As it is, the eggs do hatch in the main tank, but the little larvae are soon eaten by various fish. 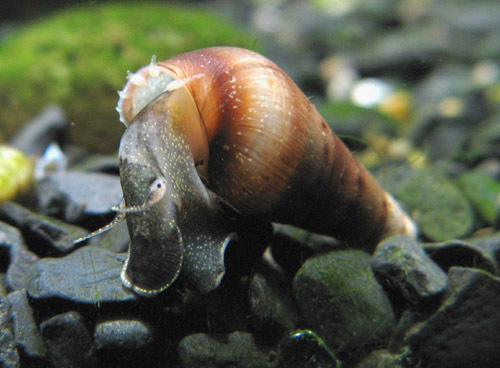 This is the Malaysian Trumpet Snail, Melanoides tuberculata. These small (1.5cm) nocturnal snails are much praised on the net by American aquarists, because during the day they burrow in the substrate, keeping it well tilled. I got all excited when I spotted some at the local store, but the owner looked at me funny when I wanted to buy them: in Japan their benefits are evidently not well understood and they only make their way into store tanks by accident. Indeed, the three or four I was subsequently given free of charge multiplied exponentially within a few months. This Otocinclus spp. (?) is one of the algae-control crew. These fish eat algae off plant leaves, and, unlike the other crew members, nothing else. I haven’t even seen them munching on the spinach. Fortunately they’re small enough (maybe 3cm) that they can always find a morsel growing somewhere in the tank. 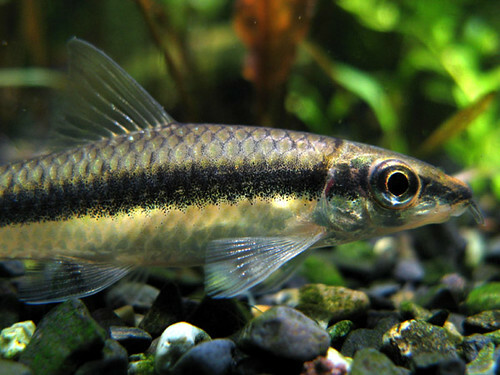 I am not exactly sure why, but the so-called Siamese Algae Eater (Crossocheilus siamensis) is one of my favorite fish. The rightful chief of the algae-control crew, he is known to devour even algae which all other creatures find unappetizing, so that along with the Caridina shrimp he can be seen in almost all planted aquaria. 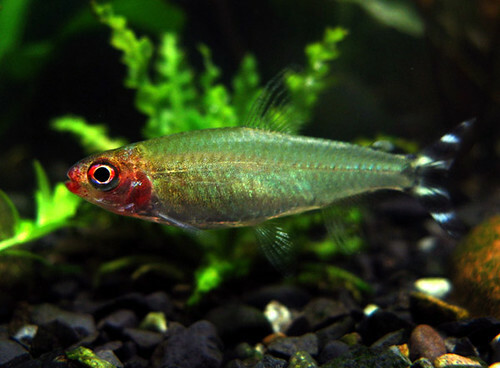 At about 10cm in length, this minnow-like fish is the largest creature in my tank (I’ve chosen to stock exclusively small fish). It's not exactly colorful, but the reflecting silver belly, jet black side stripe, and dorsal scales enhanced with a dark-brown pattern, give this fish a very pleasing textured look. Heavier than water, he rests on the substrate, or more comfortably on a large plant leaf when not active. The underside of Gastromyzon or Beaufortia spp., aka Hillstream Loach. I made a bit of a mistake with this fascinating fish, thinking it a type of pleco-like suckermouth. What I did not find out until later was that these fish live in fast-flowing streams in the mountains of their native Borneo where they cling to rocks – hence their suction-cup fins as well as mouth. Anyway, to be truly happy they need a special stream setup, and a mostly stagnant aquarium is not really suitable for them. Nevertheless for a few months this character could be seen eating algae off the glass or sitting by the filter outlet where there was at least a little current. Then he disappeared – I am not sure where to, but perhaps he died, and the shrimp made a quick meal of what was left of him. 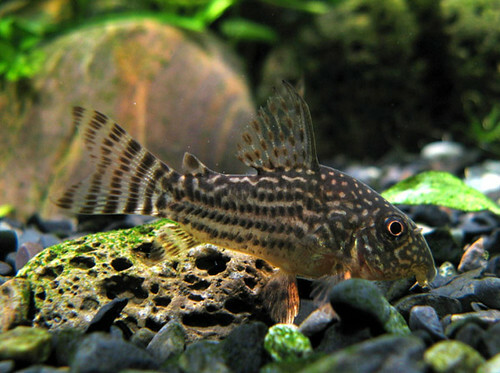 This is Corydoras sterbai, one of the most sought-after of the numerous similar species of corydoras catfish from the Amazon basin. A loose shoal of five of these fish scours the substrate in my tank, looking for morsels. Very shy at first, they are gradually getting used to their new digs and lately can often be seen out in the relatively open front area of the tank. The Rummy-nose Tetra (Hemigrammus bleheri). I keep a small school of eight of these delicately colorful fish. They are lively swimmers by the day, but by night their color fades completely and they sleep wedged in the plants or on the substrate so that at first I was alarmed some had died! When they are happy their whole head turns a rich crimson red, and this is also a good indicator of water quality and general living conditions in the aquarium. However at such a time it’s impossible (with my camera anyway) to get a clear picture of them, so here is one that is just waking up. 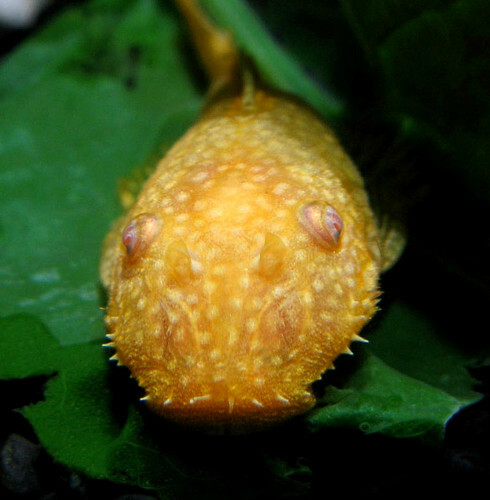 Bushy Nose Pleco (Ancistrus spp.) 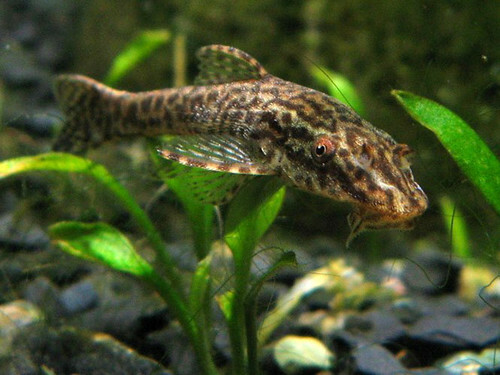 This fish is also a part of the algae control corps. He’s fun to watch, darting from driftwood to glass to plant leaves all of which he rasps clean of algae with his suction-cup mouth. Males of this genus grow bristles on their head, but this one is either still very young or a female, as there is no sign of bristles. 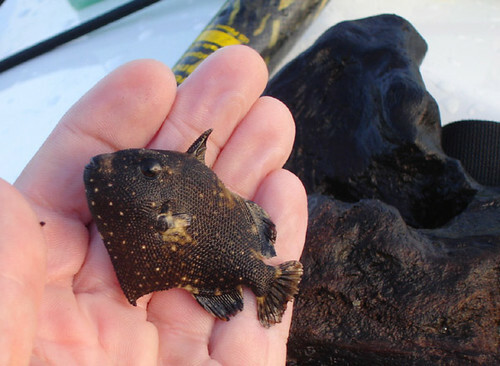 Or perhaps it's not an Ancistrus at all? 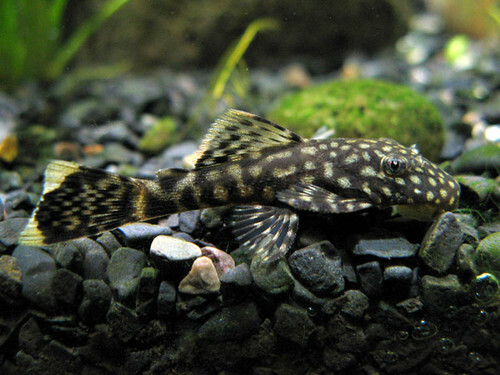 These pleco-like catfish are notoriously difficult to identify, owing to a plethora of similar-looking species, which may have been further hybridized by breeders. The one more Ancistrus that lives in the tank is an albino and he’s begun to grow some bristles. Normally, 'serious' aquarists shun albinos and such, claiming they are 'unnatural' (albinos occur in nature but are soon spotted and eaten by predators). But when I saw how cute this guy was, I couldn't resist. At first he would not come out of his driftwood cave by light, but lately he can be lured out with some tasty soft spinach. The time has come, the walrus said, to write up a few things, so I will tackle a favorite but as yet untold story, from a half-crazy time early last summer when Leanne went back to Canada for ten days to attend her sister’s wedding. Leanne and I are a pretty inseparable team, having spent virtually no time apart for the last five or six years. We work together, eat together, sleep together, have adventures together, always. So as we briefly parted ways, we both expected some fluctuations of the psyche. Hers, however, would be moderated (hopefully) by the presence of her family, while I was setting myself up for a real roller-coaster with a planned return to an old hobby of mine: the aquarium. I used to keep tropical fish, aquatic plants and insects, and other such vermin throughout much of my elementary, junior high, and high school years. Having lived under the authority of my parents, and further, having to gainful employment at that time (save a short abortive stint as a waffle-maker at the Canadian National Exhibition which landed me a used VIC-20 computer that set off yet another life-changing chain reaction), I was limited to a small tank and cheap equipment and while I learned many fascinating things, I never had the feeling I was doing things right. Well, somehow I decided the time has come to rectify that, and a week alone was the perfect chance to mess up the apartment, run around shopping, etc. The conviction to do things right was paramount, and things quickly escalated into near-obsession status. My first round of shopping yielded shockingly little of what I needed and wanted, save for some fish and plants, which I kept alive and well for a while in the bathtub (some even laid eggs there which hatched into healthy fish I have since given away). Eventually I ordered what I needed on the Net. Every day was a whirlwind of research, endless net searches, ordering, canceling, re-ordering…I was having a great time. Finally, after a week, the dust was settling and all there was left to do was wait for the order to come in…and one final errand. On a trip two years ago to Koshiki, an archipelago 40km south across the sea from Amakusa, I had thought absent-mindedly and yet prophetically as we landed on a beach of dark sand and gravel in a beautiful place with a waterfall: this would be the perfect sand for an aquarium. Fish, like most other creatures on Earth, get nervous about predators, and light substrates such as the sand commonly sold at aquarium shops make them stand out against the bottom when seen from above; the fish know this and live under constant stress. 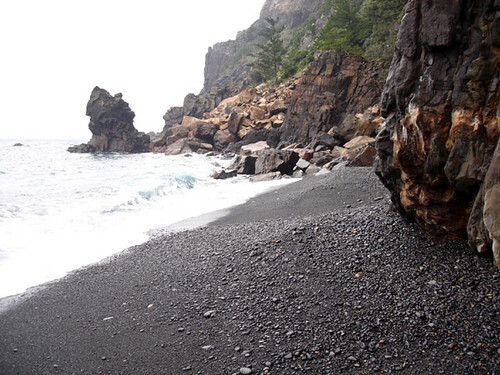 Black sand is therefore the best. What’s more, this Koshiki sand was beautiful: every pebble showed subtle patterns caused by melting together of the various layers that formed this metamorphic rock. It was not calcareous, and so would not affect the chemistry of the water; the few shell fragments it contained could be burned off with an acid soak. This was it: the perfect sand. 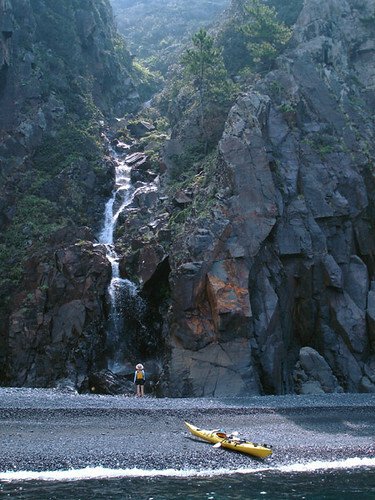 Leanne stops to admire the waterfall at 'the beach' in August 2005. I could have gotten some rather expensive but suitable sand on the net, but would it be perfect? Most black sands available there looked like lava fragments which would be too abrasive for some of the bottom-dwelling fish I was planning to keep. So the present search for perfection was leaving me no option but to go back to this beach, though in the meanwhile I had forgotten where it was exactly. 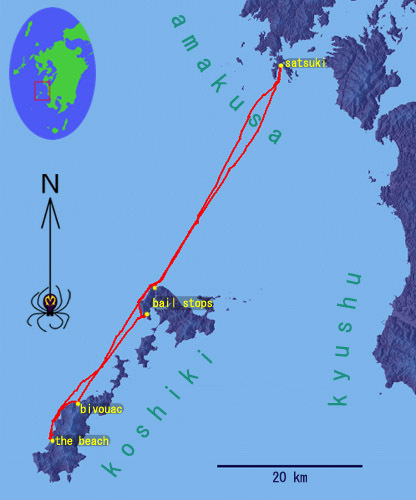 Initially, I planned to go by car and ferry, launching the kayak from a convenient local port, but as chance would have it, a storm was on the way heralding weather bad enough to shut down the ferry system during the only available travel window, possibly stranding me in Koshiki. My boss would likely take a dim view of this, especially because with Leanne gone, we were already short on staff. So the diabolical plot thickened: since it actually takes just as long to paddle there as it takes to go by ferry (due to the convoluted route), if I went by kayak I could start twelve hours earlier and beat the storm. To boot, I would save nearly 200 bucks in ferry tickets. And so it was decided. Not all that glitters is gold (and vice versa). 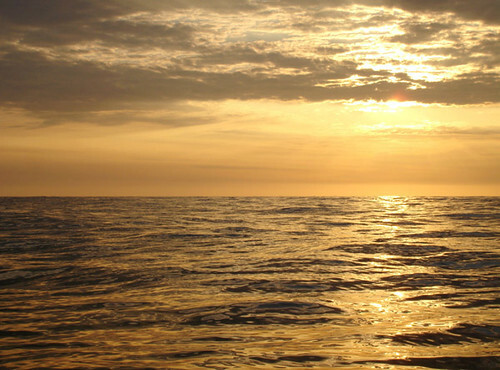 Sunset on the sea halfway between Amakusa and Koshiki. Floating on the open sea, I spotted an attractive piece of driftwood; after lifting it onto the deck I saw this baby leatherjacket swimming helplessly, deprived of his home. Without the drifting log to protect him, he would soon fall prey to bigger fish; resigned to his fate, he made no effort to escape as I scooped him up with the palm of my hand. He needed the driftwood more than I did, so I left it floating there for him. As it happened, both the 40km traverse there and back was mismatched to the tidal currents, and the weather forecast was far from ideal. There was nothing to be done but to put up with it; anyway I had the wonderful Hayate which about canceled the effect of the sea currents. Looking at the GPS track from two years ago, I noted every place we landed, eliminated a few, and re-armed my GPS with the rest. I aimed straight for the first point, 60km distant, and arrived there around midnight after an uneventful 10-hour nonstop paddle, only to find large, white boulders. No matter; I set up camp and slept a few hours. I needed no alarm clock: I snapped awake at the first sign of dawn to find a stiff south wind blowing and the waves seeming larger than forecast. I might yet strand myself here, I thought. But soon I was fighting the elements, inching south against the wind in search of my treasure past sea cliffs that form the wildest and most beautiful coast in Kyushu. The vertical walls concentrated the wind to the point where I could only barely make it past the headlands. As Murphy’s Law would have it, the magic beach was the very last of the marked points. Looking more carefully at the geology, it was really a freak place: all the rock left and right was ochre or yellow compact sandstone; only a narrow band of black metamorphic cliff hung above a valley where a stream fortuitously eroded it and washed the precious debris over a waterfall directly into the sea. The beach was hardly a hundred meters long and were it not for the stream constantly recharging it with sediment, the sea would soon wash it away completely. As it was, sand and pebbles of all sizes were to be had, nicely pre-sorted by the waves! Back on the black beach. Two months and a typhoon later, we'd stop here yet again, to find most of the sand washed away. 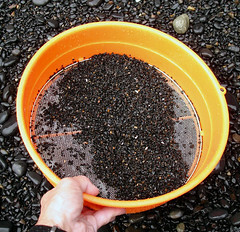 I spent several hours sifting my black gold further until I had about 50 kilos of just the right size pebbles. Loading the sieve with sand, I would walk directly under the waterfall and let the powerful stream do the sifting for me. What I was doing seemed to have great beauty and harmony: a man intently at work in his natural environment. I knew then all was right. But when I loaded it all into the boat, along with a few large decorative boulders, and pushed the now incredibly cumbersome craft into the water, I was surprised to see the stern completely awash! Shucks, I was going to have to leave some precious cargo behind! This I did and rebalancing the boat, I was able to get it to float level but with the seas right up to the gunwales. Thusly, I set out on the return trip, and with the wind and waves pushing me along, the overloaded boat still wallowed forth at reasonable speed. The weather socked in further, and soon I was enveloped by fog. 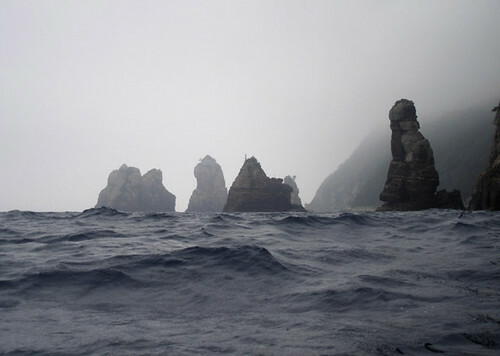 It was during the 7km open traverse between the two main Koshiki Islands that I noticed the stern was again riding a little low. It was hard to judge in the rough water, but with even the smallest waves washing over the low-riding deck, water was probably seeping in through the hatches. Paranoid thoughts then gripped me – this way I certainly could not chance the full traverse to Amakusa: if the stern sank completely I would have no way to remedy the problem! I would have to jettison some more cargo. I landed as soon as a shore came into view; this was all exposed to the waves so it was a bit of a crash landing really. I could barely heave the boat half-clear of the surf. Sure enough, the back end was flooded. I dumped some more sand and boulders, pumped out the bilge, and this time loaded a good quantity of cargo right into the cockpit. It was a tight fit but if in a panic I could now jettison ballast en route. Relaunching, I came around the rest of the island, then landed again to check for leakage. There was some, but it seemed all right. A final pumping and off I went, committing myself into the mists of the roiling East China Sea, with darkness also slowly descending. The coast takes on a somber appearance on the return trip. It was pretty hard work to haul all my treasure up the stairs from the beach.